Clinical Herbalist Cameron Strouss is awarded Registered Herbalist status by the American Herbalist Guild. We, at Deep Roots Apotheke & Clinic, are happy to announce that as of March 2018 Clinical Herbalist Cameron Strouss has received the certification of Registered Herbalist, or RH (AHG) as imparted by the American Herbalist Guild; the primary governing body of herbal professionals in the United States. It is a great honor and reflects an excellence in clinical work, education, continuing education, outcomes in clinical work, and experience. Certification ensures that practitioners adhere to a certain standard of care, ethics, and focus on continuing education in order to stay current in research, modalities, dietary interventions, and botanical medicine. …have approximately two years of comprehensive academic training in botanical medicine, through formal education, independent study or a combination of both. In addition, two years of clinical experience obtained through independent practice, formal mentorship, supervised clinical training as part of an academic program, or a combination thereof, totaling approximately 400 hours are advised. RH (AHG) status is prestigious and as such Cameron is one of only three Registered Herbalists in the State of Alabama. 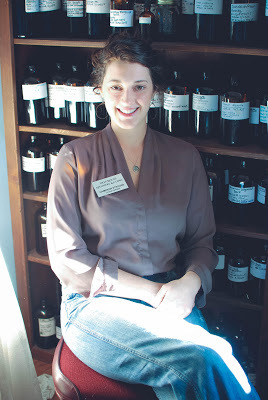 Cameron is excited to continue to provide the best care that she can through continuing her education and providing the most up to date and informed herbal care possible. She is happy to add this certification to her credentials and looks forward to a clinical aromatherapy certification in the coming year. To learn more about clinical appointments contact Crystal at 205.790.3285 or email deeprootsoffice@gmail.com.